If you’re a fan of the mint/chocolate dessert combo, then this recipe will be right up your alley. 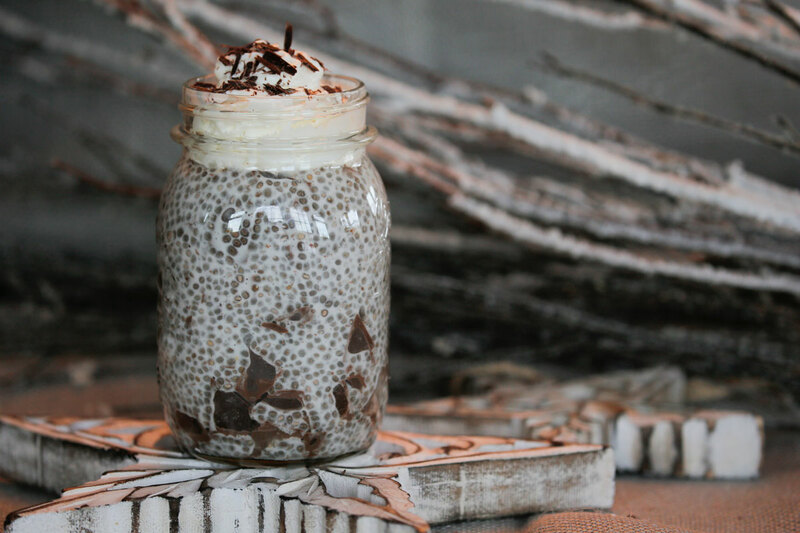 We love chia seed pudding because we can satisfy our sweet tooth and get a health boost. Did you know that chia seeds are a whole, vegan superfood naturally high in Omega-3 essential fatty acids, dietary fiber, protein and amino acids? Not only is this dessert full of chia seeds, but it’s also dairy and gluten-free. Step 1: Pour coconut milk and chia seeds into a large bowl with a lid or use a shaker cup. Don’t forget the lid, because the last thing you want is chia seed and coconut milk all over you and your kitchen. Stir in the peppermint essential oil, vanilla, then vigorously shake for about 1 minute (make sure all the chia seeds have been shaken in). Place container in the refrigerator for about 4-5 hours; overnight is preferable. Step 2: Chill a can of coconut cream overnight. Before serving the chia seed pudding, remove can from refrigerator and scoop out coconut cream leaving behind the coconut water (in an effort to not waste the coconut water, we usually store it in a container and use it for a smoothie). Mix cream until light and fluffy. Set aside. Step 3: Take ½ of a dark chocolate bar and break it up into tiny pieces. We used a knife to get the pieces small enough. Set aside. Then take the remaining ¼ piece of the chocolate bar and use a cheese grater to grate the chocolate. Set aside in a separate bowl. Step 4: It’s time to prepare and serve. Take out the chia seed pudding and stir in the ½ cup of the chocolate pieces. Dish the pudding into two containers. Top with the coconut whip cream and garnish with the ¼ cup of chocolate shavings. Servings two (three with smaller portions).